Admit it. When you hear the word “prunes,” you think of what your grandmother used to eat. If I said “dried plums” instead, would it make a difference? If it doesn’t, it should. I love prunes, always have, but dried plums does sound like something more modern. Prunes, I mean dried plums, taste wonderful and sweet with only 25 calories per plum. They are also fat-free, cholesterol free, a good source of fiber, and contain vitamin K, potassium, copper, and boron. 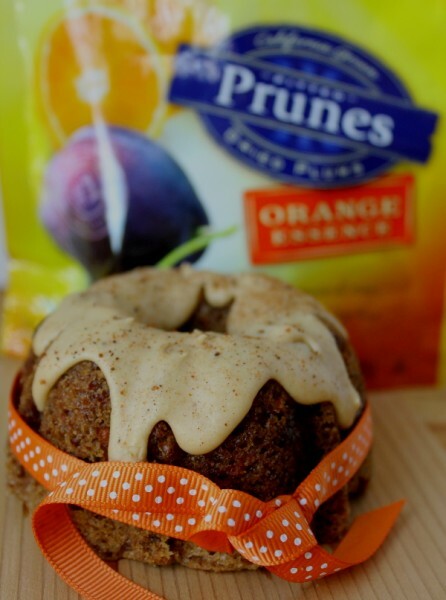 Now that the holidays are upon us, if you enjoy giving gifts of food or need hostess gifts, everyone will love these mini bundt carrot-dried plum cakes with an icing made with either prune juice or orange juice. They can be individually wrapped in plastic and tied with a pretty ribbon; or for a dinner party, each guest can have their own mini dessert. Sunsweet has taken the dried plum to a new level with their orange essence and cherry essence flavors. They not only taste wonderful but make baking with them even more fun to work with in developing new recipe ideas. I came up with a carrot-dried plum cake that is so nice and moist with the addition of the dried plums and just a little hint of orange. For the next recipe, how about something really unconventional for dried plums – truffles! These are rich and delicious and also great for gift-giving or hostess gifts – or just to have on hand in the refrigerator or freezer for a dessert or snack. These dried plum peanut butter-chocolate truffles with sea salt are so delectable yet easy to make. They can be served at room temperature or straight from the refrigerator, and they freeze well, so you can even make them in advance. First make a smooth and creamy peanut butter filling, chill it, then wrap filling around each prune and chill again. When cold, dip them in melted chocolate and sprinkle with sea salt. That’s it! Easy to make, but they taste and look like expensive truffles. Prunes are not just stewed or old-fashioned anymore, especially if we call them dried plums. The possibilities are deliciously endless! Heat oven to 350 degrees. Grease and flour six mini bundt pans and set aside. 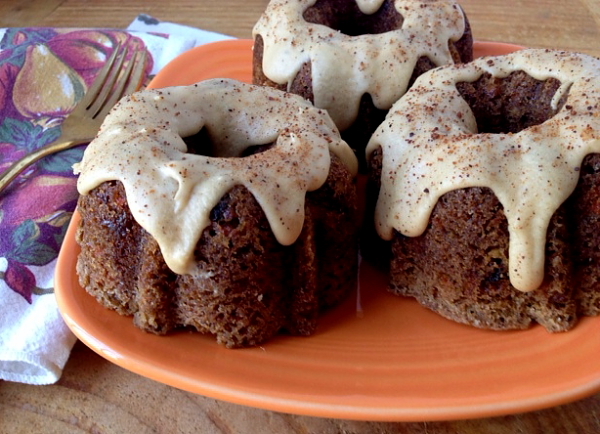 (If you don’t want to make mini-cakes, use a regular bundt pan, greased and floured). In a large bowl, combine dry ingredients; set aside. In bowl of electric mixer beat eggs, sugar, and oil until well blended. Gradually add dry ingredients and mix just until blended. Add carrots, nuts, dried plums, and raisins; stir just until blended. Do not over-mix batter. Spoon batter evenly into prepared mini pans and bake for about 25-30 minutes, or until a tester inserted comes out clean. (baking time may be different for some mini-pans, as sizes can vary, so watch carefully). When done, let cakes cool in the pan for 5 minutes, then remove and cool completely on a wire rack. When cooled, drizzle icing over each cake and let sit until icing hardens. Sprinkle with nutmeg before serving. 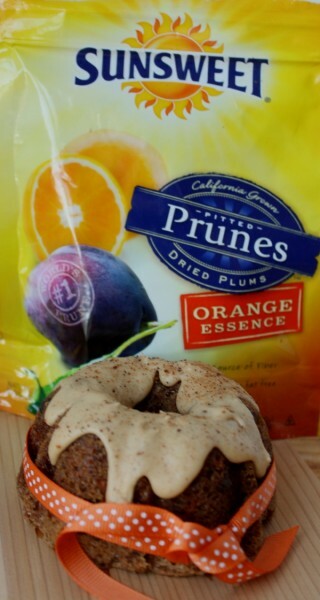 Prune or orange icing: In a mixer bowl, beat together 2 cups confectioner’s sugar, 1/3 cup melted butter, 3-4 Tablespoons prune juice or orange juice, and 1/4 teaspoon nutmeg. Beat until of a nice drizzling consistency, adding more juice if it seems too thick. Drizzle evenly over each cake and let sit until icing hardens. Keep cakes covered with plastic or in airtight containers. If you prefer not to have icing, sift powdered sugar over cakes instead. In a mixer bowl, combine peanut butter, confectioner’s sugar, butter, and vanilla; beat until smooth and creamy. Line a small baking sheet with waxed paper. Drop the mixture by tablespoons into 12 equal sized pieces. Refrigerate, uncovered, for at least an hour. Remove from refrigerator and working quickly, wrap one dried plum around each piece of peanut butter mixture and form into a ball. Place again on waxed paper and refrigerate again until firm, at least another hour. To make truffles, melt the chocolate squares. Take out half of the refrigerated peanut butter dried plums and using two forks, dip one at a time into melted chocolate, turning over and over quickly with the forks until well-coated. 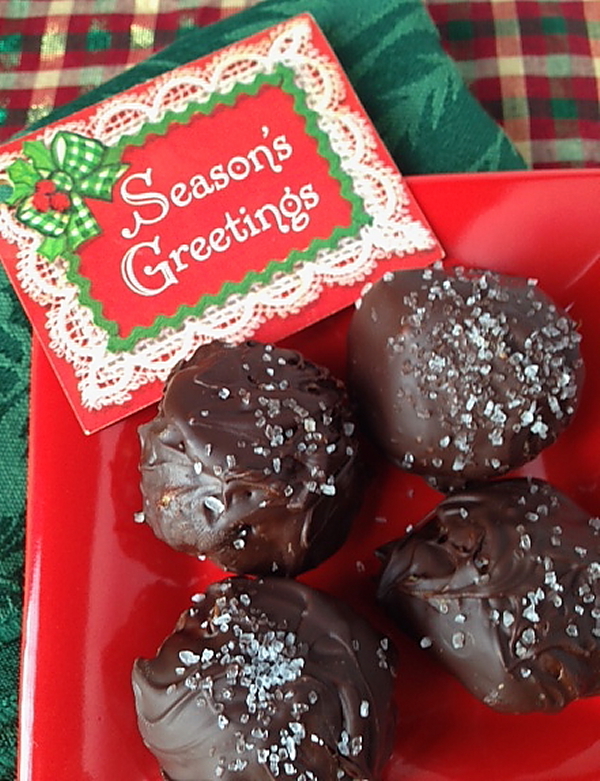 Let any excess chocolate drip off and then place back onto the wax paper and sprinkle immediately with some sea salt. The chocolate can harden quickly, so sprinkle with the salt as you make each one. Repeat with remaining dried plums. Refrigerate again until chocolate sets firmly. The truffles can be served chilled or at room temperature. Keep stored in the refrigerator in an airtight tin. The recipe can be easily doubled. Makes 1 dozen truffles. What To Do With Leftover Mashed Potatoes? Debbie – your blog continues to inspire and delight. Thank you for sharing with us! Thank you, my sweet ML!